Today AT&T has officially announced its readiness to support VoIP applications over its 3G network for the iPhone. Up until now the the Apple iPhone 3G and 3GS users were limited to using only Wi-Fi connection for VoIP services. 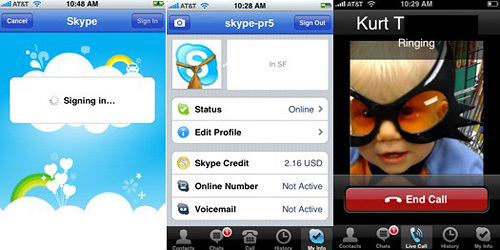 Effective now those handsets will be able to make calls over 3G with VoIP-enabled software such as the Skype app. Additionally, AT&T allows customers to download or launch on their wireless devices a multitude of compatible applications, which were so far rejected from the App store. The consequences of this move remain to be seen but we are hoping the increased network data transfers won't bring the overall speed down noticeably. When? They say now, but it still doesn't work. To do that you have to pay Skype who are pretty expensive compared to other VOIP providers.